While her grandson Sultan nibbles on a roti, Shanti lies wrapped in a blanket, ignoring the hunger pangs. Her son and daughter-in-law have gone to work as daily wagers in Sehore near Bhopal, 300 kilometres away, leaving behind two of their four children with the grandparents. There is no work in Shanti's village of Bhadauna in Lalitpur, the Uttar Pradesh district bordering Madhya Pradesh, part of the region of Bundelkhand. Unseasonal rain and hailstorms washed away the winter crop of wheat at the time of harvest in February and March. The monsoon crop of urad dal shrivelled up as the rains failed. If two successive crop failures weren't bad enough, the soil is now so arid that many farmers cannot plant the winter crop, and those who have, have stuck to sowing wheat in small parcels. For Sahariya adivasis like Shanti, who have no land of their own and work on the fields of others, there is nothing to do, and little to eat. “Ab khaani to hai apan ko chaar roti ya paach,” said Shanti, sitting up to talk. "I should be eating four-five rotis. But I’m not getting that many. Mil rahi hai do ya dedh. I’m getting only two rotis, or one and a half." “After the children have eaten, whatever is left, we eat that,” she said. A younger woman, Kundan Devi, Shanti’s neighbour, stood overhearing the conversation. “Let me show you what we are eating,” she said, and went inside her home and came back with this. 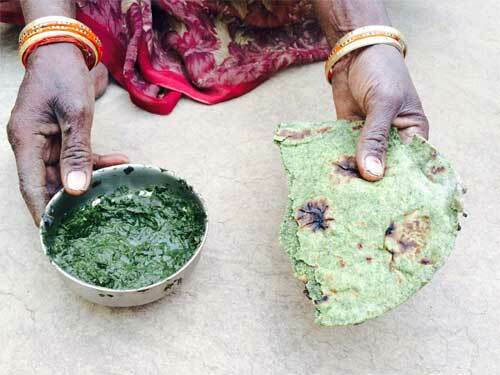 The rotis were made with a mix of wheat flour and leaves that grow wild, she said. As Shanti’s small courtyard filled up with neighbours, in the chorus of voices, someone exclaimed, "Ghaas kha rahe hai, ghaas. We are eating grass." Just then, an old woman appeared in the lane, carrying a potli on her head. Her name was Biniya Bai. The bundle contained an assorted collection: the dust of dal left behind by a farmer after threshing. A wild rice-like grain found on the edges of fields. The seeds of a weed called samai. Biniya had spent the day painstakingly collecting the fallen seeds by pressing a cloth against the earth. The seeds would stick to the cloth, she would gather them, bring them home, pound them into flour and mix them with the dust of dal to make rotis. This wasn’t the first year she had fallen back on eating samai, she said. But never before did she have to walk past two villages before she found them. The rainfall had been so scarce this year that even the weeds had failed to sprout. More recently, since 2002, like other districts of Bundelkhand, Lalitpur has seen erratic rainfall, with several years of drought. The crisis turned severe enough for the Centre to announce a special package of Rs 7,266 crore for drought relief and development in Bundelkhand in 2009. But this year, according to people, the rainfall has been abysmally low – worse than any other year in recent memory. Manvendra Singh, an activist with the non-profit Parmarth, said this year the situation was "one step above drought". The data of the Indian Meteorological Department bears out people’s perceptions. According to the data, between June 1 and September 30, Lalitpur district saw just 321.3 mm of rain, which is 66% less than normal. The scarcity of rain has put drinking water sources under stress. In Muktaura village in Lalitpur’s Talbehat block, only two of the ten hand pumps have water – the rest have turned dry. Women in village after village reported walking long distances to fetch water. The hand pump near Sangeeta's house has dried up. She makes six rounds to a hand pump one kilometre away to fill 18 pots of water every day for her family. But the crisis isn’t limited to water – food stocks are running low. If the Sehariyas are making rotis of the seeds of weeds called samai and fikar, other communities, who have small pieces of land, are plucking the leaves of a weed called ghoma to eat in the place of vegetables. The ghoma is a wild plant that grows on the periphery of fields. What about dal, I asked. She laughed, giving me an incredulous look. And milk, I asked hesitatingly. “Do you see the cows tied there? They are dry as a twig. Can you see any fodder around?" According to the 2011 census, Lalitpur is home to 1,221,592 people. Of those, 312,129 people, a quarter of the population, are Dalits and adivasis. Even if a fraction of them are cutting back on meals, it means tens of thousands run the risk of malnourishment, if not starvation. Bundelkhand has 13 districts, seven of which lie in Uttar Pradesh and six in Madhya Pradesh. Last week, the Swaraj Abhiyan led by politician-academic Yogendra Yadav released the findings of its survey of 1,206 households in 109 villages in the seven districts of Uttar Pradesh. Eighty-six per cent of the families told the volunteers that they had cut down their intake of dal, 79% said they were eating rotis and rice with salt or chutney, and 84% said they had cut down on milk for their children. The survey was done by volunteers trained in a day and did not adhere to rigorous methodologies. But it is still indicative of food distress in the region. Even if they aren't facing hunger, Lalitpur's relatively affluent communities are feeling the pinch of a failed monsoon. Jalim Raikwar is the archetype of the hardworking Indian farmer who is eager to learn new techniques, buy the latest seeds and expand his farm operations. While he owns just two acres of land in Vijaypura village, the 42-year-old cultivates another four acres on a sharecropping basis. Last winter, he invested Rs 20,000 in sowing wheat but got poor returns – the damaged crop yielded just 40 quintals of grains. A part of the harvest was sold to recoup his investments, to meet the family’s consumption expenses and to fund the wedding of his son. Another part was sold to invest in the monsoon crop of urad and sesame. The failed monsoon has left behind dry stalks of sesame in the fields. The government had heavily promoted sesame as a monsoon crop but it could not stand the poor rains. Now, Raikwar has borrowed Rs 10,000 to sow the wheat crop, for which he would have to pay Rs 300 interest every month. The family’s stock of grain from last year is likely to last till the next rain. But if the wheat crop fails, not only would their debts accumulate, they could run out of grain. Jalim Raikwar has sown just a portion of his fields this year. Even for that, he had to take a loan from the local moneylender. This year, the Uttar Pradesh government has waited till November to acknowledge the drought. A government order was issued on November 19 declaring 50 districts of the state as drought-hit. Lalitpur is one of them. When I called him on phone to discuss the relief measures initiated by the administration, the district collector, Roopesh Kumar, initially said he was busy with the panchayat elections and asked me to call back in two days. But the village level governance was weak in the region, I said. Could it be relied upon to identify vulnerable families on the verge of starvation? “The governance is considered weak but it is not,” he said. “That’s your perception.” With that, he hung up. The welfare state has made the drought relief measures of the colonial state permanent. Together, the public distribution system of food rations and the provision of work under the Mahatma Gandhi National Rural Employment Guarantee Act can stave off hunger and prevent famine. But talk to the people of Lalitpur and it’s clear that the only reason people have escaped hunger is because they have moved out for work. Migration is a more reliable safety net here than anything the state has put in place. Take MGNREGA. People in drought-hit areas are eligible for 150 days of work under the job scheme – and not 140 days as the collector erroneously claimed. According to the website of the Ministry of Rural Development, 58,358 families in Lalitpur have been employed under MGNREGA this year. 2,426 have completed 100 days and just 763 have been given work for more than 100 days. In village after village, the poor either did not have job cards under the Mahatma Gandhi National Rural Employment Guarantee scheme, or had not been given work for years. Sitaram and his wife Omvati in Vijaypura had last been given work under MGNREGA in 2010. "I once gathered the courage to ask the Pradhan for work," said Omvati, "but he said there is no work for you. He's a Rajput. He's giving work to his people." Her husband added: "It's not real work. It's shown on paper and the money is distributed." The government gave plots of land to landless Sehariya adivasis. Most were were given plots of land to cultivate but it was often rocky and barren. Fortunately, the couple managed to get an antodyaya ration card which entitles them to 35 kilos of foodgrains – 20 kilos of wheat at Rs 2 a kilo and 15 kilos of rice at Rs 3 a kilo. The actual supply was more in the range of 25-30 kilos, Omvati said, as she sat picking stones from the grains. Yet she was grateful for the rations since the family isn't in a position to plant a crop this winter – there is no water to irrigate their plot of rocky land.